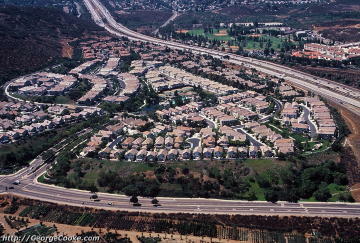 This site contains Vista del Lago community information and aerial photographs from the Rancho Bernardo area of San Diego, California. This upscale residential community sits at the northern edge of Rancho Bernardo. This is where I-15 meets Pomerado Road just south of Lake Hodges. Pomerado Road runs along the bottom of the photo. I-15 (southbound) runs across the upper right corner of the photo from right to left. The RB Community Park and Casa de las Campanas can be seen above the freeway. Paseo Monte Batalla (lower left) is the entrance to Vista Del Lago from Pomerado Road. Bernardo Vista Del Lago, a gated community, backs up to Battle Mountain. Its community center includes impressive swimming and tennis facilities. 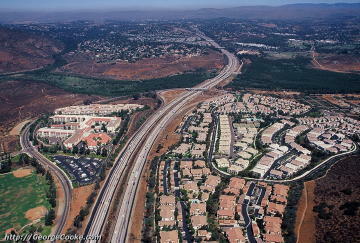 This view looks north from Rancho Bernardo along I-15. Casa de las Campanas and the RB Community Park are on the left. Vista del Lago is on the right. Lake Hodges (without water) is in the San Dieguito River Park (someday to extend from the ocean at Del Mar to Volcan Mountain just north of Julian). A planned pedestrian/bicycle bridge across the lake will connect the RB Community Park with the nature trails in the River Park. Escondido is in the background. This is the view from the west looking across the RB Community Park. I-15 can be seen running from left to right (north to south). The community of Vista Del Lago is above the freeway, with Battle Mountain to its right. 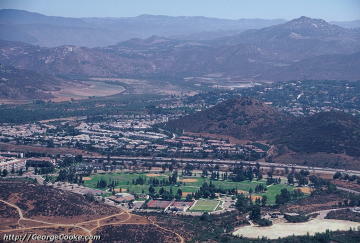 In the background, you can see the San Pasqual Valley and the RB Trails. The RB Community Park offers lighted fields for baseball, football, and soccer. It is also the site of the City's Recreation Building and the Joslyn Senior Center. And for our four-legged friends, the new dog park is ready to open its gates. These statistics are based on actual solds with escrows that closed between January 1, 2001 and the indicated "as-of" date. 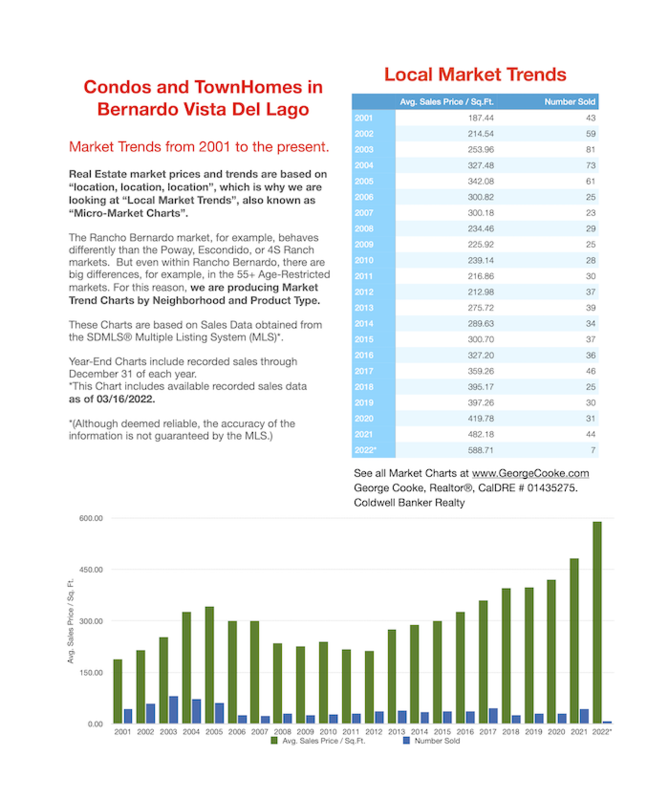 (Sales data as per SDMLS®). This information is believed to be generally accurate, but is not guaranteed. For more communities in Rancho Bernardo, Poway, and the I-15 Corridor in North San Diego click here. To view this page within the context of my primary website, please click on the link below. At GeorgeCooke.com you'll be able to find more photographs and information on other communities, including a wide selection of real estate topics.